We’re only a short hop, skip and jump away from Photokina 2018 which means new photography kit aplenty. And that is exactly what Lowepro has to offer, with a brand-new range of Lowepro ProTactic backpacks and other goodies. In all, Lowepro has unleashed 10 products for photographers to stick their kit into - ranging from all-encompassing backpacks to smaller but equally useful Quick Straps. If you're looking for the best camera backpack, the Lowepro ProTactic BP 350 AW II and ProTactic BP 450 AW II bags are standout. Both bags can fit two DSLRs, with lenses attached, up to eight lenses, laptop and other accessories. The main differentiation between the two is that 350 AW II has room for 1-2 standard DSLRs, one with 24-70mm f/2.8 lens attached and a 13-inch laptop, while the 450 AW II ups the ante to 1-2 Pro DSLRs, one with a 70-200mm f/2.8 lens attached and a 15-inch laptop. To make sure your kit doesn't get damaged, LowePro has added a composite shell for impact protection, provides a raincoat for your gear (in the form of the All Weather AW Cover) and has created a cradle for your laptop to safeguard it from knocks. Sliding down the size scale, there’s ProTactic Lens Exchange 100 AW (Fits a standard and ultra-wide zoom lens) and ProTactic Lens Exchange 200 AW (Fits Osmo, speedlights or shotgun microphone) lens cases available. If a utility bag is your, er, bag then the ProTactic Utility Bag 100 AW and ProTactic Utility Bag 200 AW are for you. 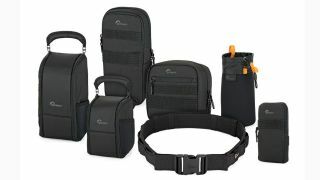 Lowepro has also revealed brand-new bottle pouches, utility belts, a phone pouch and some quick straps. Price wise, the range begins at £11.95 for the quick straps, up to £259.95 for 450 BP II bag. For more details, visit Lowepro.com.